I love container vignettes! Here are 16 of my favorites. Besides being visually appealing, they are so portable! If you need to clear off your coffee table or dining table, with all the decor corralled in a crate, it's a snap. Use what you have! Like a button jar! A fall vignette is always colorful and this one situated in a vintage raisin crate, is no exception. A vintage thermos and lanterns are in among gourds, mini pumpkins, raffia and Indian corn. Quite a while ago, I painted an old dirty suitcase inside and out with cream colored paint. 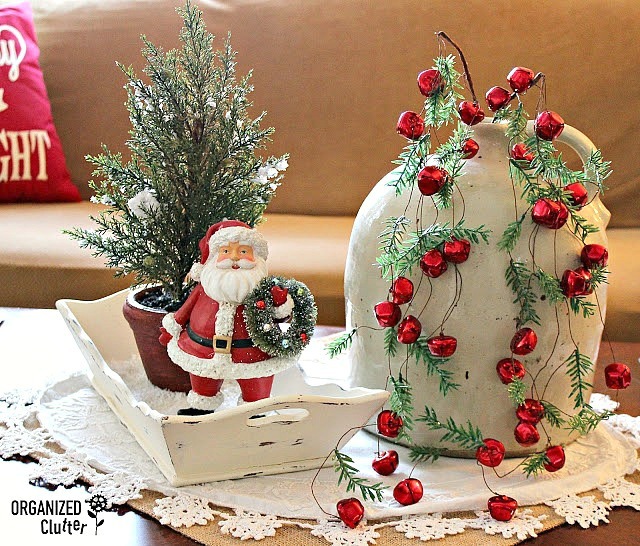 It became one of my go to decor piece for container vignettes. Here I added both Christmas decor, a flameless candle, and a few antiques. 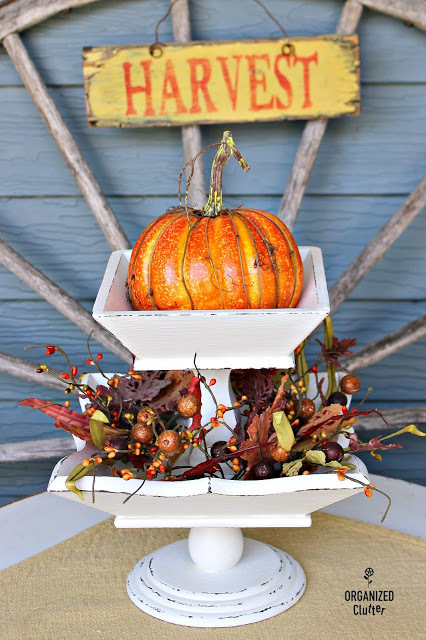 This is a recent fall vignette that used two vintage upcycled wooden pedestal bowls stacked on top of each other and fall decor. Easy and fun for any holiday. Here is my vintage upcycled wooden tray back at Christmas time. This wooden thrift shop tray is so versatile in vignettes. Mine is upcycled with Annie Sloan Chalk Paint in Old White. 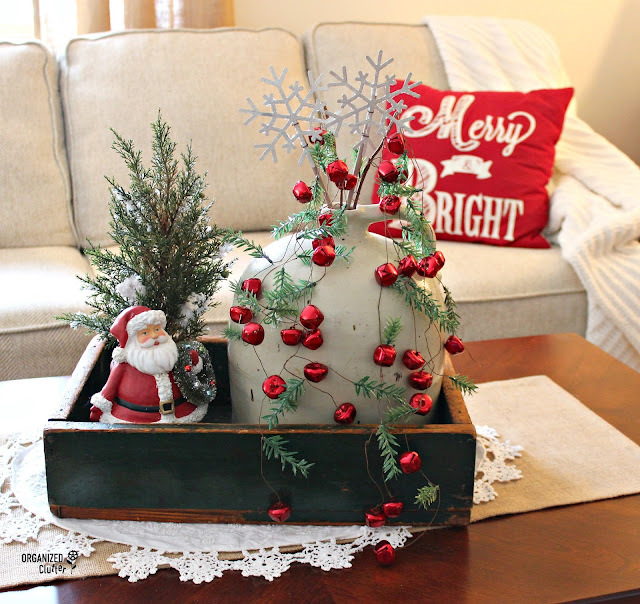 Last Christmas my coffee table centerpiece was situated in a chippy dark green crate! Here is a spring vignette in a crate. Vintage garden books, tools, and rusty lantern without the glass combine with spring decor. This awesome red chippy crate was perfect for potted summer plants. Another red crate summer vignette on the covered patio. 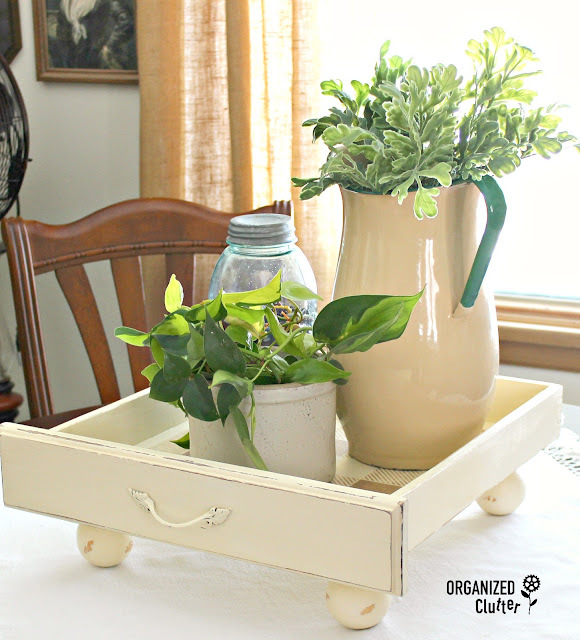 Here is a recent repurposed drawer tray used on my dining table. 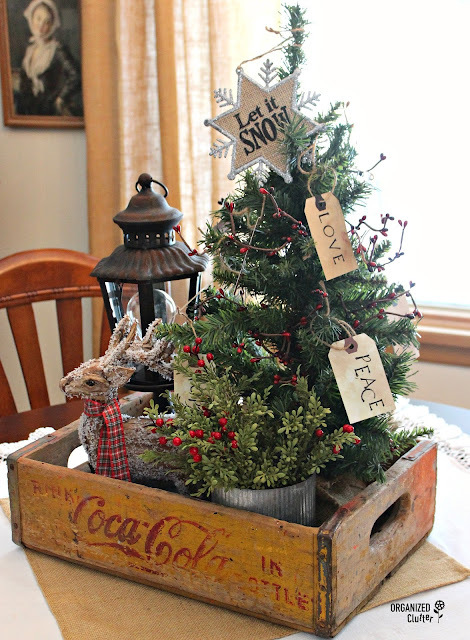 Last Christmas's Coca-Cola crate vignette. This Valentine's Day vignette is placed in a vintage metal baking pan. This is a use what you have vignette with sewing notions. Here is an Easter oval basket vignette with my button Easter eggs and rag balls, and colorful Easter decor and candy. Houseplants go outside under the covered patio in the summer and this raisin crate vignette was placed on an old wooden chair. Even a terrarium with blue and white china is a fun container vignette piece. Vintage toys in a narrow crate at Christmas time. Make you next vignette, a container style vignette! Your flair creativity and talent pleases me. I can read a story or walk down memory lane seeing your vignettes. Always a winner. I love all these! Great ideas to work on during our long Minnesota winters. 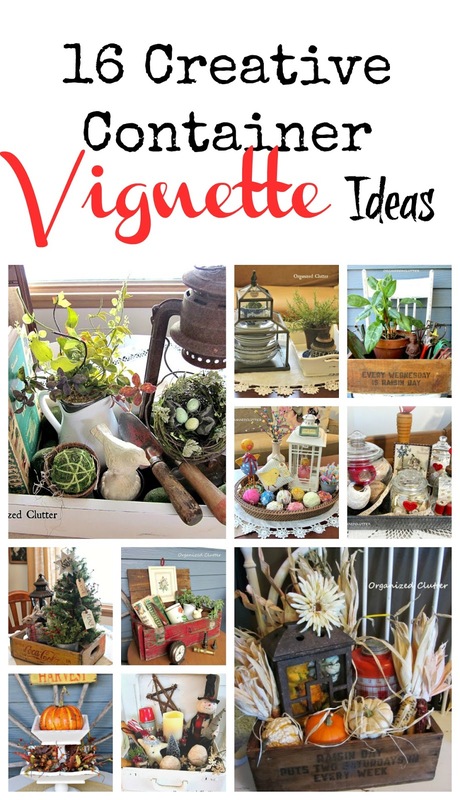 I really like the assortment of wooden boxes and trays you have for vignettes. The read chippy box is my favorite. So much character! You have a great idea for design.